It's time to shed the taboos around mental health - this guide helps you take control and be your own expert. Psychiatrist Dr Steve Ellen and comedian Catherine Deveny combine forces to demystify the world of mental health. Providing an insider perspective, they share their personal experiences of mental illness and unpack the current knowledge about conditions and treatments. What do we know? What don't we know? How do we get help? What actually works? 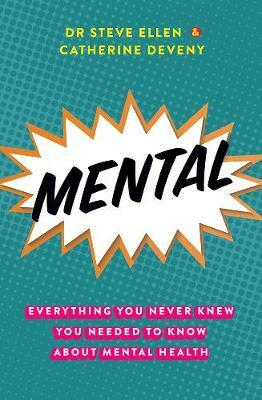 Punctuated with anecdotes, real-life stories and reflections on the cultural and historical context, Mental is an irreverent and entertaining guide to the full spectrum of mental health issues - from depression and anxiety to schizophrenia, personality disorders and substance abuse. Set to become a go-to guide for anyone with a mental illness or supporting someone who has one, Mental breaks the taboos around mental health and offers clear practical advice on how to live successfully. Dr Steve Ellen is a professor of psychiatry at the University of Melbourne and the Director of Psychosocial Oncology at the Peter MacCallum Cancer Centre. He is a broadcaster on 3RRR, a weekly regular on ABC Melbourne and has written for medical journals, textbooks and print media. Catherine Deveny is a writer, commentator and comedian. She is the author of eight books, including Use Your Words, The Happiness Show, Free to a Good Home, Say When and It's Not My Fault They Print Them.